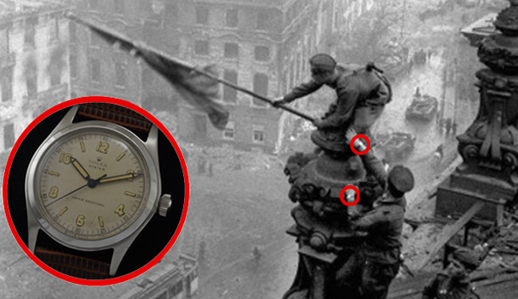 Russians have always appreciated a good strong watch, and until the collapse of the Soviet Union the domestic watch industry competed effectively against most foreign brands. But the past two decades have almost destroyed the value Russians themselves attribute to such domestic watch brand-names as Polyot and Vostok. The conspicuous display of foreign watch brand-names as an indicator of Russian power, success and wealth hasn’t helped. On to these little wrists is usually strapped the symbol of the success of their owner’s brains. And no watch symbolizes prestige quite as universally as Rolex. But what if Rolex is busy pumping so many new watches into the market that its scarcity value is actually diminishing? Would it continue to be the Russian mark of business success if the Rolex secrets were to spill out? And if the Russian oligarchy stops wearing Rolex, and opts for rivals such as Patek Philippe, Blancpain, Breguet and the rest, what will become of Rolex FOR LIFE’S DEFINING MOMENTS — as the Rolex advertisement in the financial media likes to say? The luxury goods market looks to be a regular case of demand-supply equilibirium, in which high price reduces demand and scarcity reinforces the perception of value. But that is pure marketing. According to the Business Week tabulation of global brand value in 2007, Rolex ranked 71st – ahead of all watch brands, but one notch behind Kleenex. That year, the Rolex brand value was estimated to be worth about US$4.5 billion in turnover, growing at 8% per annum. Founded in London at the start of last century by a German watchmaker named Hans Wilsdorf, along with his English brother-in-law Alfred Davis, Rolex started with Swiss movements and English components. It moved to Switzerland during World War 1 to avoid British taxes. In 1944 Wilsdorf established the Hans Wilsdorf Foundation, which is reported to be treated in Swiss law as a charitable foundation, and thus saves on Swiss taxes. It continues to hold the shares of the company; Wilsdorf himself died in 1960. Virginie Chevailler, a spokesman for Rolex in Geneva, declines to say what evidence is available to confirm that the Wilsdorf Foundation makes charitable donations. She has also refused to say how many watches Rolex produces per annum, and whether, as trade sources suggest, there has been a notable increase in recent output, with more planned when Rolex’s new Geneva factory becomes fully operational in a year’s time. Asked about Rolex’s sales to Russians or to Russia as a market — compared in growth rates to other European and Asian markets – Chevailler said: “As they touch on Rolex’s commercial strategy, an area on which we do not generally communicate, we regret that we can not accommodate you on this occasion.” Rolex’s exclusive importer and distributor in Moscow, Mercury, refused even to say this little. Reporting a year ago by Le Temps, the leading business newspaper of Geneva, indicated that in 2008, an official check of Rolex’s production suggested 770,000 pieces per year for sales revenue estimated at 4.5 billion Swiss francs (currently $4.9 billion). That year, the production rate was said to be up by 33% from 1999. Rolex’s share of the Swiss market in production of timepieces was 16.1%, but almost all (95%) of the output was sold for export. Geographically, according to Le Temps, Rolex sales went one-third to Europe, one-third to the Americas, and one-third to Asia. It appears that growth rates in Russia for the European market and China for the Asia market are accelerating, but the details are guesswork. Watchmakers in Europe say that Rolex is preparing to put on the market one million watches per annum. That represents a jump of almost 30%. To sell this many, the company is aiming, not so much at taking market share from other luxury watch brands, but rather at existing Rolex owners. Across the world, watchmakers and jewellers, who have held licences to repair and service Rolexes for many years, report that their contracts are being terminated, and they are being cut off from the supply of certified Rolex spare parts and components on which the quality of the watch and its guarantee depend. In their place, Rolex is promoting a reduced number of its own service centres. Trade sources say that Rolex has issued a global policy, requiring these centres to lift the price for servicing watches brought in by current owners, so that the cost of repair is at least half or closer to three-quarters of the price of a new watch. In Melbourne, Australia, for example, the estimate for routine servicing for a Rolex Oyster Perpetual Air King (circa 1970) is almost $1,200. In London, the price is the equivalent in pounds. By contrast, in a mid-size town in France, the licensed watchmaker still in business with a Rolex licence charges just €200 for the same job, including parts The licensed watchmakers of Geneva were charging an equivalent t price two years ago. But no more. The French watchmaker isn’t going to last long in the Rolex business, he says. That is because a flood of new Rolex timepieces is coming, and to assure that they will be sold, the Rolex strategy is to send as many old Rolexes to the scrap heap where they will compete with Asian-made replicas and counterfeits. Rolex clone movements, as they are called in the spam market, are currently priced at around $150. Full fakes or replicas can be bought for between $39 and $69. Rolex is managing its cut-throat marketing strategy in strict secrecy, and it is the secrecy which preserves the luxury cachet, at least for the time being. It is that cachet which has already destroyed the Russian Polyot. dozen units to just two — Polyot-Elite and Polyot-Chronos. They specialize in private individual and corporate orders at prices up to $10,000 per piece. There remains confidence that in the prestige stakes, if Polyot limits the number of its timepieces and raises its price, it will be able to compete successfully against the Swiss brands. 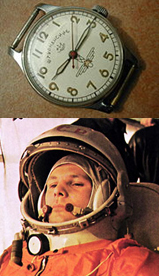 So, in Russia’s command and control positions, how do they tell the time — who wears Polyot, who wears the foreign brands? A painstaking survey of Russian wrists reveals that noone of importance wears a Russian watch, at least not in public, which is where status symbols display their worth. Not even the Patriarch of the Russian Church, Kirill – he wears a Breguet. As for Rolex, there is a minority of oligarch wearers – Roman Abramovich, Sergei Chemezov, and Alexander Khloponin, the former Norilsk Nickel boss, now special Kremlin representative to the Caucasus. 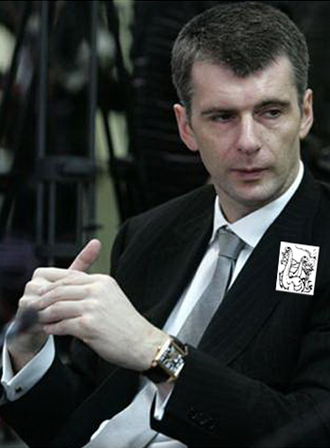 And look at what the exceptionally long Prokhorov arm displays – a Pierre Kunz Red Gold Tourbillon.